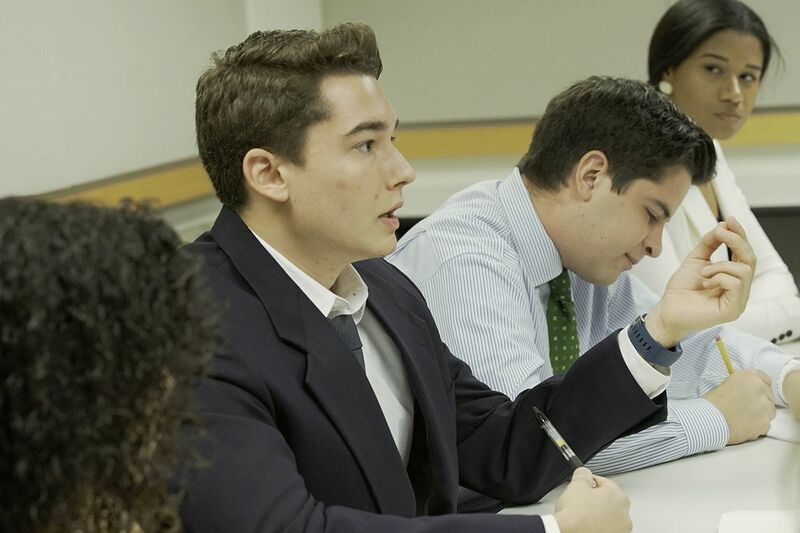 J.P. Bruno, a senior economics major, talks during a seminar-style class as part of his semester in Notre Dame’s Washington Program. 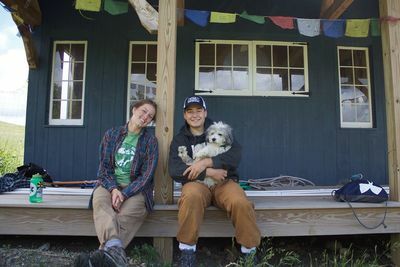 The summer after his sophomore year, Notre Dame senior J.P. Bruno was packaging maple syrup, taking care of honeybees, and tending to an orchard on a biodynamic farm in Vermont. Three weeks later, he was sitting in the White House, interning for the Council of Economic Advisors (CEA) as part of a semester in the Notre Dame Washington Program. These contrasting experiences provided Bruno, an economics and applied and computational mathematics and statistics (ACMS) major, with an assortment of skills that eventually led him to developing his senior thesis and receiving a job offer in economic consulting at the beginning of his senior year. The owner of that maple syrup farm, John Redpath, is also a commodity trader in New York, and Bruno accepted the summer job knowing he would also be spending a few weeks trading agriculture at Redpath’s firm in the city. “It was really interesting to go from a firm in New York trading soybeans right up to the super small farm in Vermont, where there were literally four college kids working and taking care of the farm,” Bruno said. 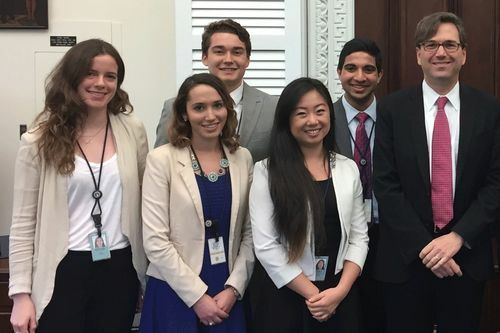 Bruno (third from left) stands with Jason Furman (far right), then-chairman of the Council of Economics Advisers, and other White House interns. Bruno, a Glynn Family Honors Scholar, applied to several internships in Washington, D.C., where he was preparing to study during the fall semester of his junior year. After applying to think tanks, journalism organizations, and government internships, Bruno received an offer from the CEA — practically a dream internship. An agency within the Executive Office of the President, the CEA is responsible for advising the president on economic policy. The council consists of three members, each with a team of distinguished economists under them. Bruno’s work focused on the U.S. trade portfolio, specifically the Trans-Pacific Partnership (TPP) that the Obama administration was negotiating during his time there. Bruno assisted in the fact checking and publishing of materials, as well as brainstorming ways to present supportive information related to the agreement. In addition to trade portfolio work, Bruno was selected to prepare daily briefings and assist in the speech writing and editing process for Jason Furman, then-chairman of the CEA. Bruno relaxes while at a maple syrup farm in Vermont, where he spent a summer taking care of the property and trading commodities in New York City. Bruno’s writing abilities were also put to use during his most recent internship experience in the Chicago office of Cornerstone Research, an economic consulting firm. As a summer analyst, Bruno not only improved his data analysis skills, but he also assisted in writing reports, a task not typically assigned to interns. Bruno was no stranger to this type of pressure-filled environment. His time at the CEA prepared him for dynamic work environments — which he now thrives in. “At this point in my life, I like the fast-paced stuff, and I really appreciate having a deadline to work towards,” Bruno said. 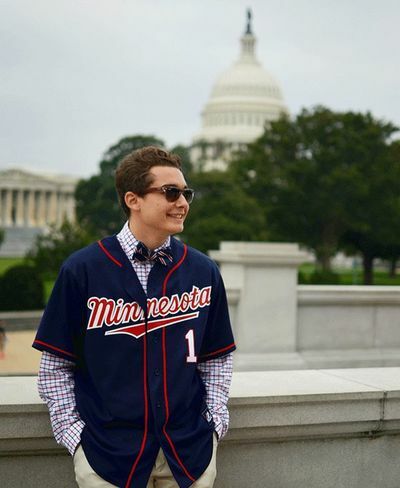 Bruno, a native of St. Paul, Minn., wearing a Twins jersey in front of the U.S. Capitol. Bruno has already accepted a full-time analyst position with Cornerstone Research, leaving his senior year open to focus on his final coursework, his role as a residential assistant in Zahm Hall, and his economics senior thesis. Bruno’s research utilizes a database of economics integration agreements developed by Jeffrey Bergstrand, a professor in the Department of Economics and the Mendoza College of Business. Bruno is implementing a six-level system of trade agreement classifications to study the impact EIAs have on trade. From his time on a maple syrup farm to his work experiences in Washington, D.C., and Chicago, Bruno’s path has been a series of unpredictable twists and turns. But no matter where he is, Bruno remains grounded by consistently searching for small ways to keep himself intellectually stimulated. Originally published by Teagan Dillon at al.nd.edu on October 24, 2017.